The first time Chris and I drove out to Colorado together was for Andy and Cami's wedding back in May of 2004. My how time has flown. My how Nick has grown! They started their newlywed lives in BYU married student housing: Wymount. While Chris was on his mission, sometimes I ran into Andy on campus. They even invited me over for dinner once or twice. 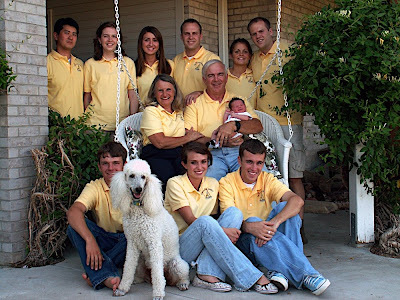 Just a few weeks before Chris got home from his mission, they had their first baby, Drew. Drew-be-do. It's funny to see these pictures of Drew when he was just barely crawling and now he's running around like a little human being. This was 4th of July 2007 outside the Lavell Edwards Stadium trying to catch a glimpse of Corbin Bleu. Our next Evans Family Reunion (which I was officially a part of! Yay, I made the cut!) was in Oregon in 2007. This is my favorite picture of Andy, Cami and Drew. Happy little family in Oregon. 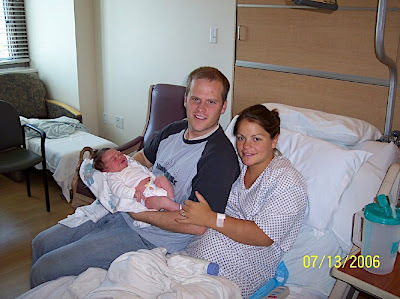 Then in February of 2008, Avery was born. Everyone thought she was going to be a boy, but I was happy they had a little girl. It'll be so much fun to take her shopping and take pictures of her and scrapbook them as she grows up. When she was a few months old, me and my American Crafts buddies did a screenprinting activity and I got to make a little onesie for Avery using Jen's cute design. Once again at the Evans' Family Reunion. Year: 2008. Place: Afton, Wyoming. Drew loves anything on wheels. Avery looking particularly adorable at the reunion. Happy Halloween 2008 Peter Pan and Tinkerbell! This is me and Drew, chillin' out in Colorado over Thanksgiving break 2008. A tender moment between Drew and Andy as they reenacted the manger scene in the Evans' barn for Christmas 2008. Avery pounding her first birthday cake in February 2009. These were taken just a few weeks ago at the park. I'll miss having Andy as my personal banker at Wells Fargo. He's taken good care of me. I'll miss loaning out our DVDs every once in a while. I'll miss Cami's awesome cooking. I'll miss my only niece and nephew. Until the Evans Family Reunion 2009! Good luck Andy, Cami, Drew, Avery and soon-to-be-born Luke! PS - I would add pictures of them packing up and moving, BUT, my chinchilla chewed all the way through my wireless router power cord so my internet no longer works in the living room. Dang chinchilla. I'll have to plug the ethernet cord directly into my computer and upload more pictures later tonight. Until then, ciao! These are my final pictures of Drewbie and Avery before they head off to their new life in Arizona. Avery decided to like me and let me lead her around with a finger and even hold her for 10 minutes. Meanwhile Drew was running around, getting out his final kicks and jollies.